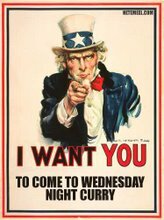 Wednesday Night Curry: WNCNDSGDP - Year 4! That is correct ou read it here forst folks. WNC has been going for 4 years. Ok so admitedly this year has been sparsely littered with curry, but you know I had to do the wedding and honeymoon thing and new businsess thing...all that kind of stuff. Anyhoo. You should have all had the e-mail about The Wednesday Night Curry Non-Denominational Seasonal Greetings Drinks Party on the 17th. I know it is a Thursday but you can't have it all. see you there my spicy little samosas. How do I get on your mailing list? @garlicconfit sent me!